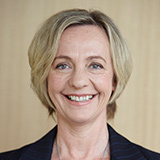 Professor Marian Baird (PhD) is Chair of the Discipline of Work and Organisational Studies at the University of Sydney Business School and Professor of Gender and Employment Relations. Professor Baird is Director of the Women♀Work Research Group. She is a Fellow of the Academy of the Social Sciences in Australia, a Fellow of the University of Sydney Senate and a member of the Women's College Council. Professor Baird is Co-Editor-in-Chief of the Journal of Industrial Relations and is on the editorial board of the Australian Bulletin of Labour. She is also President of the Industrial Relations Society of New South Wales.